The Art Deco era began in France at the apex of the 1910’s. It lasted into the 1930’s. The idea was to combine modernist styles with fine craftsmanship and rich materials. 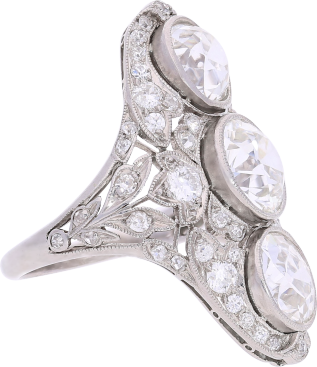 In today’s world, Art Deco is known historically as one of the golden era’s of art, and ring hails from the great era. 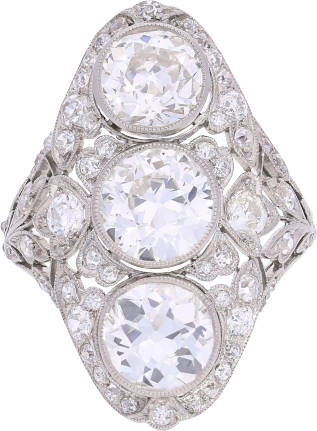 This ring truly captures the essence of the Art Deco era. It is set in platinum, known as the finest of the precious metals, and is very clearly of the finest worksmanship, with an intricate design and perfect symmetry. The ring centers three “old european” cut diamonds, each weighing roughly 2.05 carats. The ring is accented by 58 round-brilliant cut diamonds, weighing approximately 0.5 carats. The diamonds are what are known as “top river” color. In the days before GIA established the D-Z color scale for diamonds, the colors were classified as “Jager”, “River”, “Wesselton”, and others. By todays standards, a “top river” color equates to an E color diamond. The diamonds in this ring do not carry certificates from the world leading laboratories, as sending them to be inspected would involve un-setting the stones, and thus the ring would lose its antiquity. Gad & Co is proud to offer some of the world’s finest vintage and antique diamonds and jewellery for sale through our Hong Kong retail location. Our rings are chosen purely on the quality of the stone and the craftsmanship involved, and are sourced from all around the globe, offering customers a diverse range of styles, designs and fixtures to choose from. Buying from Gad & Co ensures that you’re getting the most beautiful, authentic diamond jewellery from some of the old masters of jewellery.